Ten years ago I survived the 7/7 bombing in London. An act of violence, a national tragedy, touched my life in the passing moment and it turned out to be the blessing from above. My being in the carriage at the end of the train is nothing less than a divine intervention. We were the first to be walked out of the tunnel back to King’s Cross. We didn’t know it was a bomb. A nice man who stood next to me kept asking if I was ok. I had been doing Kundalini Yoga for not more than a year at that point. Weekly classes at Pineapple Studios with Guru Kaur. Occasional workshop maybe. The mind blocks thoughts of the worst. It was nothing more than an accident at the time. I didn’t even fully realise that I was on that exact train until much later in the day when the news came. Yet, it was a scary moment, and the first thing that came to me when the lights went out was Aad Guray Nameh mantra. We chanted it at the beginning of each yoga class. I knew it as a mantra for protection and the words appeared in my mind out of their own accord. It was repeating on a loop and I felt so calm and so clear; like floating above, noticing all the horrible details but not being affected by them. I felt so much peace. The sound of someone vomiting somewhere in the tunnel only now has a meaning. It was probably the tube worker who came to investigate and saw the carnage. We didn’t know our faces and clothes were black until we came into the light of King’s Cross. Seeing people rushing around with soot on their clothes and faces. Noticing my top also had a layer of black. I clearly remember a man in a business suit arguing on the phone about getting to Liverpool Street urgently for a meeting, not being happy with this delay. His intuition didn’t tell him that in an hour no one will care for his lateness. There will be no meetings that day as everyone would be watching the news in disbelief to the scale of the tragedy. Now I know that the protection mantra was written by Guru Arjun, the first martyr in the Sikh lineage of Gurus, as the opening line to his song of peace. 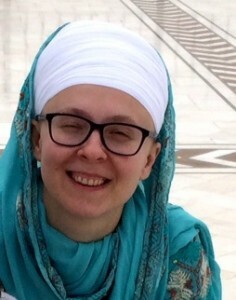 Sukhmani Sahib, as it is known to Sikhs, so called for the peace it brings to the mind. It was the power of naam that carried me through the disaster unscratched and content, not a natural inclination towards the career in the emergency services as I first thought. Where was I and where is Guru Arjun? And yet, Guru Arjun came to me through the power of his word, carrying the vibration through time and space and I was also able to experience that calmness he felt sitting on the iron plate and being burnt alive. I am forever grateful to those who knowingly or not have sacrificed their life to bring this gift to the current age. Siri Guru Devay Nameh / I bow to the great invisible truth.